“Design is not decoration.” A mantra mentioned and practiced by a lot of great designers – a simple concept, but a complicated endeavor. I think design is more popularly known as the method of achieving beauty, although partially true, I believe it should not be the only goal that we should aim for when designing. To digress a bit, the power of beauty in aesthetics, should not be underestimated. Beauty plays an enormous role in all things, even for a student data management software. Although it is probably the hardest aspect of design to understand and judge, many factors such as culture, time, trends, and varying tastes of individuals make this concept very subjective. It is common knowledge that not everything beautiful to someone might be beautiful to others but even if absolute beauty is achieved through design, it still does not ensure the design’s full utility. This is what design should aspire to be; not senseless decoration done only to battle with the “boring”, but achieving beauty through being able to fulfill a design’s intended purpose as simply and efficiently as possible. So what does it mean to design? Through my years of designing, I work with one thing in mind—that design is a way of interacting. I learned this very early on in my design classes when I was starting my career and I’ve learned to embrace this idea as I grew older. I respect my career choice more and more every day because of this idea. I’ve learned that the simple and effective interaction between the design and the consumer is what alights true and long-lasting beauty. We interact with others every day in our life. Probably one basic visual form is by words. The alphabet and type setting was invented, or a better term for me would be, “designed”, to increase the avenues of communicating comprehensively with people. Through this, we are able to surpass distance and time that once restricted us from communicating with others not near enough (or even with us yet) to communicate with us. This simple invention has solved these problems and has created more benefit to the human race than its original intention– thus deemed to be a true example of great design. Effective interaction is delivering an idea cohesively, concisely, and efficiently. There are times when simple and straight forward is the best way to deliver an idea. But there are also those situations when simplicity with a few words, like in poetry, transcends more than just understanding a particular idea—sometimes influencing emotion and action because of how well the idea is embodied in a few lines of text. We interact not just by words and not just with people but through everything; from the floors we traverse, to the clothes we wear, to the chairs we sit on, and to the computers we use every day. We interact by way of first understanding how to use a particular object and how to influence the object to cater to our needs as humans. It is interaction with the pavement that helps us get from point A to point B by comprehending the path, the direction, the elevation, and the obstacles that exists between our start and end points when we travel by foot. It is interaction that gets us to understand how to put our clothes on, make our food, work to maintain a livelihood, and live comfortably in our homes. Sadly, although it is a reality we face every minute of our lives, I think that this is where good design seems to be lacking. Look around you and think of all the possible improvements you can add to the objects you interact with every day to improve interaction and attain your everyday goals much more efficiently. I can bet that you’ll never see things the same way again! 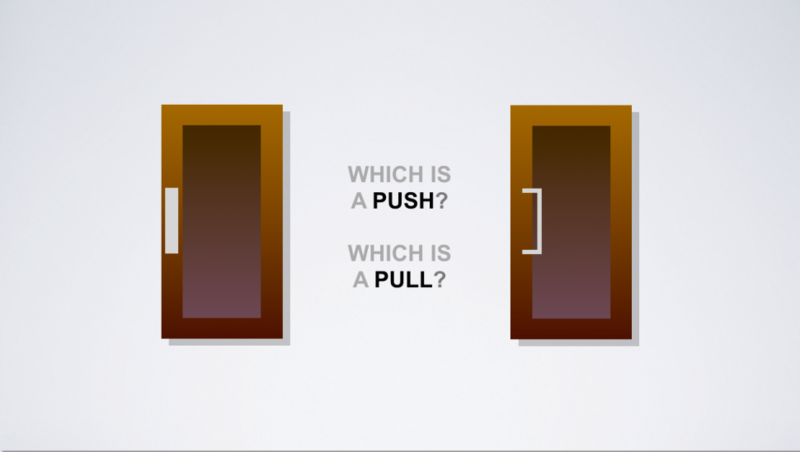 FIGURE 1.0 – A good way to think about good design is through doors. Before opening it, does the design of the door tell you which way it opens? If it doesn’t, it’s probably because of the misleading decorations, then it is not well designed. The best example of good interaction through design is through doors. Don Norman, from his book “The Design of Everyday Things”, uses this concept a lot because it portrays the idea excellently. Don Norman says that something as trivial as doors should not take a person a long time to try and understand how to interact with. Think about it, you should really only have two common choices with a door—to push or to pull, but in today’s world, if you examine more extravagantly decorated doors, the choice is usually not clear. Think about the way a handle is designed, if the handle can be grabbed, what is the most natural action a human can do with it? You should be inclined to pull the handle, correct? Most doors today, have a standard handle which still requires you to push. Notice how a lot of establishments have this problem, as a lot of customers make the mistake of pulling the doors, pausing a bit, laughing at themselves thinking it was their mistake, and then doing the attempt again, but this time, successfully. Again, it seems to be such a trivial thing, but the impact really magnifies itself when these mistakes add up. This greatly affects customer traffic which may impede potential profit for the establishment. Imagine if the knob was replaced by a flat plate on the door, where no one was able to grab on to anything. The next most natural action is to push, right? Imagine the magnitude of consequences a simple bad design decision can produce. Imagine if the problem was safety, where in an emergency, knowing how to open a door is the sole determiner of life and death. Like doors, good design in everyday things is something we normally don’t expect, even if it desperately needs it, but there are those where good design is highly expected—like in interaction design. In this era, computers are part of “everyday things” and they are usually deemed very complicated machines, but should they be? Apple asks this question and thinks differently and sees computers as an opportunity to exhibit good design. They focus on producing a simple yet effective solution to cater to most needs rather than bombard their products with decoration and features. They produced the iPhone, a computer in your pocket, probably in everyone’s pocket today… tech-savvy or not. We all know how to use it, even its most complicated features all because of good design. Notice their design style through the years—they almost don’t decorate. The majority of their design decisions count for something they want to communicate, from the size of the screens of their phones (to account for the radius of the users thumbs to efficiently operate the device with a single hand), to the simplicity of the operating system, frequently updating itself to reduce redundancy, complication, and clutter. The beauty was produced out of the simplicity and effectiveness of the design, almost as if declaring war against useless decoration. At eScholar, interaction and communication through design is very important especially with eScholar myTrack. myTrack is an application developed by eScholar that helps teachers analyze and manage student data and create and track student goals using its goal setting system. In the app, data is not only communicated through words and numbers—it is communicated differently in every situation using indicators, graphs, charts, and special visualizations to make the analysis easier and more efficient. These specially tailored visualizations can be found throughout the app especially in visualizing item level data on assessments and risk indicators on our early warning system. The team believes that presenting this information well helps educators focus more on making better decisions based on the information that is given to them through the application. FIGURE 2.0 – We often stumble upon charts that have so much decoration because the creators think it looks boring. Decoration will most likely complicates a design, rather than help it to be consumed more efficiently. Notice on the left graph how difficult it is to find proper associations for which bar is for which region based on the color. Also notice how the shadows, the thick borders, and the gradients all do not function as expressions of the data, rather, they are useless elements for decoration. The chart on the right does the job efficiently, all elements and aesthetic decisions have their purpose, demands very little from the user to comprehend what is presented, and is readable even when printed without color. Thanks to the observations of Elaine Rulla, eScholar’s customer education expert with our partners at Arlington Texas, we were able to eliminate issues that we faced from the lack of a consistent system of presenting data. Elaine shared how big of a negative impact presentation makes to interpretation, when teachers are required to view data presented in a visual form where it becomes more of a distraction than an aid. If not visualized, the usual standard is to view the data in Microsoft Excel or in other assessment programs available to them but she says that it is not always easy to understand, and sometimes become subject to misinterpretations. Design isn’t just for how data is presented, but also how the user navigates and accesses the data that they need. The journey, the discovery, and the correlations they make from looking at different data points are powerful if used effectively in terms of the purpose that they expect to fulfill, but due to the lack of systems that offer this kind of access and guidance, and understanding of the user’s needs, confusion and misinterpretation ensues. Elaine also shared that there were times that data is usually presented in tabular format without distinguishing characteristics, becoming more challenging to interpret, increasing the probability of crossing lines and shifting columns. This becomes more significant when analyzing item level data because of the need to jump out of context to move momentarily to other data points to make comparisons, increasing the difficulty of holding the information mentally. The point of good design is that it should not require more work from the user, it should have helped them understand better and easier, not add to the burden. With the amount of analysis required per student without the help of these systems and given the scarcity of time educators have to produce such analysis, it is likely that a higher “macro” analysis is skipped, or even not considered anymore, but our team at eScholar believes that providing this kind of data is important and gives a richer understanding about the bigger picture. Simplicity and efficiency in a visualization is key to an effective rendering of data visually. Edward Tufte, an expert and proponent of simple and effective data visualizations, advocates on the use of the idea of the “smallest effective difference” to show variations in the data simply and accurately. There is no place for decoration in the data that we visualize in myTrack. The second and third dimensions in those “pretty” 3D charts you see in Microsoft PowerPoint look very interesting, but they do not communicate the information efficiently and effectively for the teacher to understand at a glance. These “decorations” can be misleading, especially on data that has very minute but critical variations. A potential data point deemed to be “positive” data but in reality is “negative”, just because of a three-dimensional chart’s decorative perspective, is a potential incubator of misinformed decisions. The accuracy of the data shown in an inaccurate visualization might lead to neglect and complacency, resulting to the student being left behind in his or her performance. In visualizing data as influential as this, what does a teacher gain in interpreting a three dimensional graph if the data has only one dimension? The perspective, and the other dimensions are all decoration—beautiful but useless, or worse, misleading. FIGURE 3.0 – Pie charts look good when presented, but they are inefficient. Basic comparisons of data points usually only have one dimension, but pie charts force a second dimension into the picture. 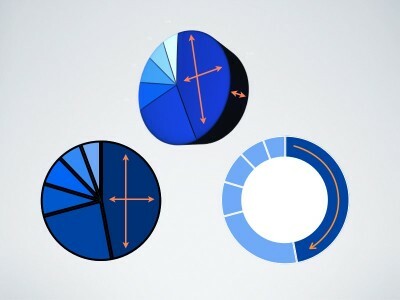 With pie charts, humans are forced to think about area (length multiplied with width) rather than just length, even worse is when a pie chart is turned into a three-dimensional chart (length multiplied with width and multiple further with height), requiring an estimate in volume. Good design is communicating as simple as possible, why use three dimensions if one is enough? eScholar myTrack pays attention to this and works continuously to produce visualizations that reject useless decoration and makes sure every pixel or ink is used wisely and conservatively to only show what needs to be shown in the data. This data, when visualized with what it wants to communicate, rid of useless and potentially misleading decoration, naturally becomes beautiful and attractive because of the simplicity and efficiency of meeting its purpose. Good design should give the consumer truth—truth from the data that turns into insight and then into action that leads to potentially life changing decisions for our future. We design not for beauty but for utility. The beauty will come naturally, when the purpose is met as simply and as efficiently as possible. We believe that true beauty comes when communication and interaction through design is done exceptionally well and lives are transformed for the better.